In the Department of Earth & Planetary Science, we conduct research in a wide range of fields focusing on Earth and the planets. As Japan's largest research and education center in this area of study, we are making significant advances in leading-edge research and turning out many graduates as researchers and experts. Here, we introduce you to Earth and planetary science, and to the research and educational activities embraced by our Department. Earth and planetary science, among many science studies, has unique characteristics. Earth and other planets experience complex interactions among physical processes (atmospheric circulation, mantle convection, etc. ), chemical processes (Earth surface weathering, crust formation by magma, etc.) and biological processes (carbon fixation and oxygen release by photosynthetic organisms). These processes evolve over time. So, study of Earth and planetary science must include research in physics, chemistry and biology. Further, study of the formation of planetary systems and solar activities overlaps astronomy. Thus, Earth and planetary science is unique in that it relates to all other scientific fields and is based on them. This unique relationship makes Earth and planetary science both interesting and challenging. Our study is directly connected to everyday living, especially the causes and nature of disasters. The results of our research address issues of high public interest such as global warming, earthquake prediction and the like, which means that we have opportunities to make useful contributions in areas that are of concern to our society. The Department of Earth & Planetary Science was formed in April 2000 by integrating the four departments of Earth & Planetary Physics, Geology, Mineralogy and Geography. So, although it is officially only 8 years old, it actually has a long history; the Geology Department was created at the time of the University's foundation in 1876 as one of the eight departments of the Faculty of Science, and the Department of Seismology, predecessor of the Department of Earth & Planetary Physics, was established in 1923 following the Great Kanto Earthquake of the same year. At undergraduate level, there are two departments: Earth & Planetary Physics and Earth & Planetary Environmental Science, into the latter of which the Department of Geological Science was reorganized in the spring of 2006. The Department is based in Hongo, where basic research is conducted. Due to the broad scope of our research, half of the graduate students belong to external institutes such as the Earthquake Research Institute, Ocean Research Institute, Center for Climate System Research, Institute for Solid State Physics, Research Center for Advanced Science and Technology, Laboratory for Earthquake Chemistry and JAXA's Institute of Space & Astronautical Science, and are engaged in the observation of earthquakes, atmosphere, ocean and weather and in the development of planetary probes. Some graduate students contribute directly to society by forecasting climate changes, earthquakes, volcanic eruptions and other potentially disastrous developments and events. There are five research groups in the Department. The Atmospheric & Oceanic Science Group studies various aspects of atmospheric circulation and oceans (Figure 1). Especially noteworthy is its research on the impact of the atmosphere-ocean interaction on climate and on atmospheric circulation on the planet Venus. 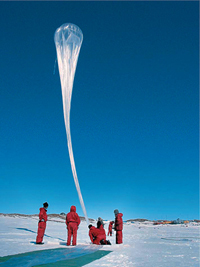 Numeric simulation programs run on the Earth Simulator, the world's largest supercomputer, have produced excellent results, as has ozone layer monitoring conducted in Antarctica, using balloons. The sphere of study of the Space & Planetary Science Group is the outer reaches of the upper atmosphere. It covers from near-Earth space, such as the auroral region and the terrestrial magnetosphere, to the solar system (planets, comets, sun and meteorites [Figure 2]), supernova remnants and the pulsar magnetosphere. 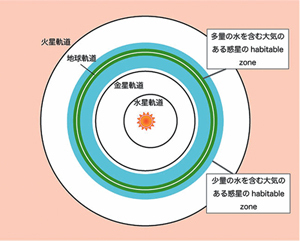 The group launches rockets (Figure 3) and develops planetary probes in cooperation with JAXA's Institute of Space and Astronautical Science. The Group is exploring the frontiers of space science. The Earth & Planetary System Science Group seeks to identify the physical, chemical and biological interactions that cause various changes and evolutions both in the solar system and here on Planet Earth. The goal of the group's research is to gain a comprehensive understanding of phenomena that are not covered by existing disciplines. The Department is, in effect, the pivot for all fields in the Department of Earth & Planetary Science. The Solid Earth Science Group studies earthquakes, volcanic activity, tectonics, geomagnetic changes, etc. The experiments conducted range from small to massive: from material science tests on rocks to global scale simulations of seismic waves and core convections. The group is participating in a project that will make the deepest probe to date into the sea floor, using the riser-drilling vessel ‘Chikyu’. The Geosphere & Biosphere Science Group focuses on study of the surface of Planet Earth, where all forms of life live. Objects of study include sediments, fossils, living creatures, and bacteria, and the relationship between life and the environment. 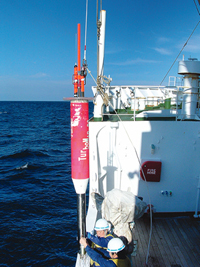 Microbe, methane hydrate, and hydrothermal deposits have been investigated by means of research vessels and submeribles. Thus, the five groups adopt different approaches but they all conduct investigations into the planet that we inhabit, dynamically (by digging, diving, flying and walking [Figure 4]), broadly (into the earth, sea, atmosphere and space) and from various perspectives (physical, chemical, biological and geographical). 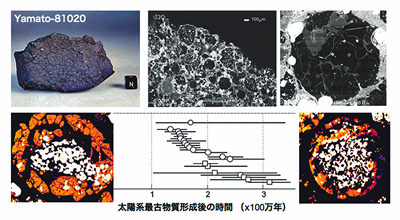 Figure 2: Meteorite Y81020 and the round chondrules that constitute it. They were formed 1.2 to 3 million years after the formation of the oldest solid material in the solar system. Figure 4: Observation in the Tibetan Highlands to research global climate changes caused by repeated meandering of circumpolar westerlies due to the Himalayan uplift. For undergraduates, there are two departments: Earth & Planetary Physics and the Earth & Planetary Environmental Science. These departments are complementary. And, while their respective curricula may differ, they have some basic subjects in common. Students in the Earth & Planetary Physics Department study classical physics and physics peculiar to phenomena on Earth and the planets in order to explore such phenomena in terms of physics. These students attend the same classical physics lectures as the physics students. It is said that there are no other Earth and planetary physics departments in Japan in which one can study physics so comprehensively and systematically. Because simulation is very effective in the study of large-scale phenomena on Earth and other planets, great importance is attached to computer education. As special research for graduation, 4th-year students are required to select two themes for the summer and winter terms and they carry out research on those themes in small groups, under the guidance of faculty members. They can choose two themes that are quite different so some students may conduct atmosphere-ocean simulations in the summer term and radio meteor observation in the winter term. Students in the Earth & Planetary Environmental Science Department conduct empirical research on conditions and environmental changes of Earth and the planets on the basis of material science, chemistry and biology. Accordingly, special emphasis is placed on field training. Students travel to various places to observe geology, water, climate, faults, volcanoes, fossils, and other subjects at the most appropriate locations for each purpose. This year, we will travel to the eastern part of Australia to observe glacial deposits and other evidence of environmental changes and the evolution of living species from the time when rivers developed and accelerated the evolution of living things on Earth, some 250 million years ago when the Australian continent was connected to Antarctica. Emphasis is also placed on training in extrapolation of information on Earth's environment from collected samples. The master's course, which is the largest Earth & Planetary Science course in Japan, admits 95 students every year. About 90% of undergraduates of the Earth & Planetary Physics and the Earth & Planetary Environmental Science (Geological Science) Departments enter the master's course, which also attracts Earth and planetary science students from other universities, as well as students of physics, chemistry, astronomy, engineering, etc. The curricula are flexible in order to accommodate the diverse backgrounds of students and their research subjects. Many students attend lectures at the particular institutes with which they are associated. Half of those who finish the master's course go on to the doctoral course, while the remainder pursue practical careers. There are various employment opportunities. Some students put their learning to practical use, while others may start working in different fields. A considerable number of students take civil service examinations and join research institutes such as the National Institute of Advanced Industrial Science & Technology, Japan Meteorological Agency, Geographical Survey Institute, etc. As subjects of research in the Department of Earth & Planetary Science are so diverse that it is difficult to present all of them here, we will introduce four of the most recent topics. Recently, there has been a series of discoveries of fixed stars with planetary systems, although no terrestrial planet has yet been found. Are there habitable planets among these systems? Professor Abe and his co-researchers study planets that may have environments in which life could exist. Because all terrestrial organisms require fluid water, an environment in which fluid water exists is considered to be a habitable planet and the orbital zone in which fluid water exists is called the habitable zone. Previously, it was intuitively assumed that the more terrestrial H2O present on a planet, the more likely it was to be habitable. Research by Professor Abe's group has shown that the opposite is the case. This is because H2O has characteristic that can destabilize the environment. One is called the ice-albedo effect: The temperature drops, snow and ice cover the surface of the planet and, with the increase in reflectance, absorption of solar energy decreases. If it gets even colder, the result could be a state known as ‘Snowball Earth.’ Another characteristic is the so-called runaway greenhouse effect: When the volume of moisture vapor in the atmosphere increases, the air gets warmer through the greenhouse effect, and the warmer climate causes more water to vaporize, leading to further warming. 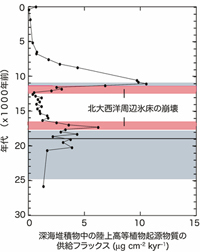 Thus, it has become apparent that the critical condition for habitability is a small zone in which just enough H2O exists as to avoid development of either Snowball Earth or runaway greenhouse effects (Figure 5). Currently, global warming is occurring as a result human activity-generated emissions greenhouse gases. Although this climate change is being regarded as a momentous development, there have been many such changes throughout the history of Earth's environment. Paleoclimatological research studies over the last 10 years have shown that the Earth's climates can change suddenly and massively. Re-creation of earlier climatic conditions by means of oxygen isotopes deployed on ice-sheets in Greenland showed that there have been many dramatic changes in climate during the last 50,000 years (Figure 6). 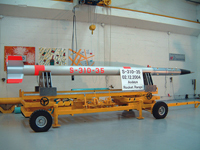 Professor Yokoyama and his group used Tokyo University's accelerator mass spectrometry device, which is capable of measuring large numbers of nuclides and is the only device of its kind in Japan and one of only a few worldwide, to analyze radionuclides. Their success in restoring past environments with great accuracy has made a significant contribution to the development of paleoclimatology. Coral, deep-sea deposits (which contain information about earlier sea water conditions), rocks, Antarctic ice samples, and other indicators are measured. Research by Professor Yokoyama's group has revealed that ice sheet decays due to earlier dramatic developments affected marine systems and caused climate change either in the Northern Hemisphere or on a global scale. The results are cited in the report of the Intergovernmental Panel on Climate Change (IPCC) and are utilized for policy recommendation. Figure 7: Irregular distribution of electric currents on Earth's fluid outer core as calculated using the Earth Simulator. Planet Earth has a strong dipole magnetic field. It is generally understood that a compass needle automatically points to the North Pole, but the fact is that this was not always the case on a time scale of hundreds of thousands of years. From geological evidence, Earth's magnetic field is known to have stably existed for billions of years. However, on closer examination, it appears to have undergone a number of changes on various time scales. The most conspicuous change is the reversal of Earth's dipole magnetic field. The latest reversal occurred about 780,000 years ago. Such reversals occur at irregular intervals of from tens of thousands to several hundred thousand years. These are considered to be reflections of changes in electrical currents flowing in the liquid metal core at the center of Planet Earth. Dr. Sakuraba and his group use the Earth Simulator, one of the fastest supercomputers in the world, to simulate numerically the fluid metal convective motion and the resulting magnetic field amplification (dynamo action), in order to elucidate these phenomena. The result, shown as a surficial distribution of electrical currents on the core (Figure 7), has revealed that the electrical currents have a patch structure extending from south to north and time variation of this patch structure determines the characteristic time scales of the variation of Earth's dipole magnetic field. Sea lilies are echinoderms that have lived in various marine environments for ca. 500 million years. The sea lily, a well-known example of a ”living fossil“, is an excellent material for paleoecological investigation. Sea lilies usually live in strong currents, fixing their stems to hard substrates and extending their arms like a parabolic antennae to capture suspended matter for food. Among them, a peculiar type of sea lily, Isselicrinus, is highly adapted to a muddy bottom environment. Isselicrinus anchors its body by grasping pre-existing stems (already detached from the individual and left on the sea floor) with its appendages. Thus, the stems always stand upright in the bed. This interpretation was developed by an undergraduate student of Associate Professor Oji's group, based on the fossils from Amakusa Islands. A similar ”relay“ strategy was also confirmed in Isselicrinus from other areas, including Gunma, Okinawa, and Tierra del Fuego at the southernmost tip of Argentina (Figure 8). 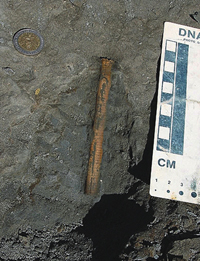 In Tierra del Fuego, Isselicrinus displays the tendency to form clusters of multiple stems in very fine-grained mud, suggesting that they had to rely on the relay strategy in locations where the currents were very weak. The distribution of Isselicrinus was worldwide 55 million years ago, possibly due to this unique relay strategy. Strangely, however, Isselicrinus disappeared during the Miocene epoch (about 15 million years ago), last being recorded as existing in the NW Pacific region. Associate Professor Oji and his group will study how the genus spread and why it became extinct. Earth and the planets have evolved in a complex manner, affected by interactions among the atmosphere, ocean, solid-earth, biosphere and solar system. Such a system is called a complex system and its development is difficult to predict. However, forecasting of Earth's environment on various time scales has become increasingly important, and greater expectations are placed on researchers working in the field of Earth and planetary science. We aim to constantly advance our research activities in order to understand and foresee the evolution of Planet Earth, and especially the mechanisms of its surface environment.